Lincoln Electric’s Mobiflex® 400-MS is a self-cleaning welding fume extraction and filtration system designed to extend filter life and reduce maintenance for users. 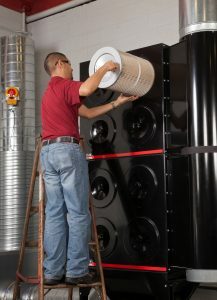 Lincoln Electric’s new Mobiflex® 400-MS is a self-cleaning welding fume extraction and filtration system designed to extend filter life and reduce maintenance for users. 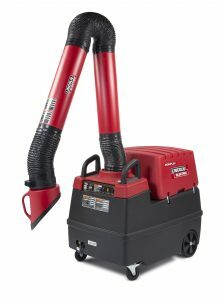 Ideal for smaller manufacturing facilities, this system provides light to medium duty welding fume extraction in variable locations. Lincoln Electric’s Preventive Maintenance Service offers short- and long-term benefits for customers who use fume extraction systems. 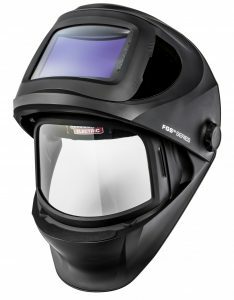 Lincoln Electric’s VIKING 3250D Welding Helmet features an Integrated Flip-Up Grind Shield to increase the operator’s field of view in both open and closed positions. Designed for the professional welder, the VIKING™ 3250D FGS™ Welding Helmet features a Flip-Up Grind Shield to increase the operator’s field of view in both open and closed positions through the integration of a clear face shield and side windows. These features can not only reduce the amount of time needed to conduct material setup, inspection and weld operations, but may minimize any potential hazards that come from having to frequently remove the helmet and store it at the worksite. The VIKING 3250D FGS Welding Helmet also boasts an industry leading optic design, 4C® Lens Technology, which eliminates blur, distortion and eye strain by reducing color saturation in the liquid crystal display (LCD) while also providing a consistent shade at any angle. This technology scores a perfect 1/1/1/1 rating on the only auto-darkening lens quality standard in the world (EN 379). The 12.5-square-inch auto-darkening viewing area is the largest for this product type industry wide, making it ideal for a range of industries that use multiple welding processes. Lincoln Electric designed this VIKING helmet with a multitude of key features that can improve productivity, enhance optic quality, revamp comfort and promote safety to position the VIKING 3250D FGS Welding Helmet as the only welding helmet professionals will ever need. Lincoln Electric is the world leader in the design, development and manufacture of arc welding products, robotic arc welding systems, plasma and oxy-fuel cutting equipment and has a leading global position in the brazing and soldering alloys market. Headquartered in Cleveland, Ohio, Lincoln has 48 manufacturing locations, including operations and joint ventures in 19 countries and a worldwide network of distributors and sales offices covering more than 160 countries. For more information about Lincoln Electric and its products and services, visit the Company’s website at www.lincolnelectric.com.